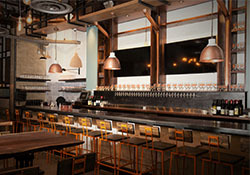 "Rittenhouse cider/sour bar and artisanal pizza kitchen features ciders and wild ales on the 32 taps and 70+ bottles. Featuring pizzas, mussels, salads and small plates in the open kitchen focusing on local ingredients. Rustic pizza uses creative and classical toppings that are prepared in custom-built wood-fired pizza oven."